Michael Kress came to Yokohama with two faces – one was an activist of an artist-run space, the other was a conceptual artist. It all started when he first came to Japan in 2012, and we sat and talked about the relevance of the Free International University started by Josef Beuys in Düsseldorf in 1974 over some yakitori. 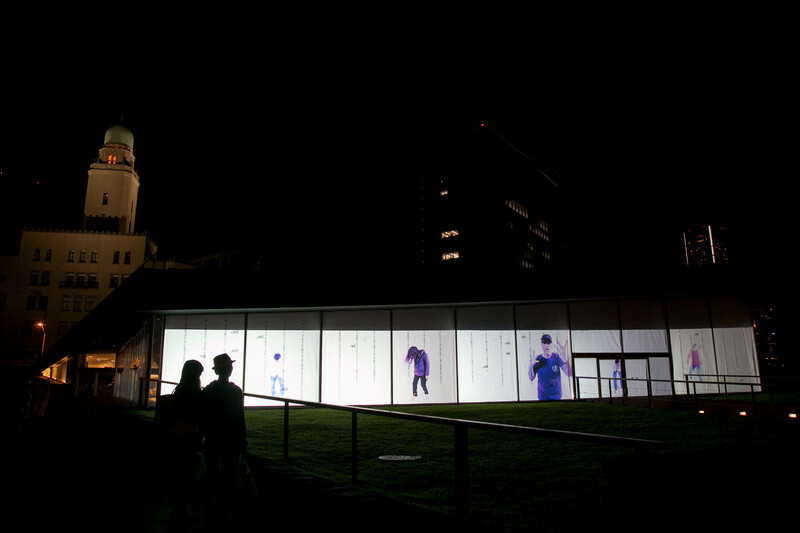 The Kress exhibit that was held in conjunction with the director‘s meeting consisted of a projected installation planned especially to fit in with the Zou-No-Hana Terrace and its surroundings. The installation itself was a projection of silently head-banging musicians, adjusted to fit within the space of a window frame. The film was purposely fuzzy, allowing the viewer to tell what color clothing the performers were wearing, their size and hairstyles, but no care was taken to show their personal characteristics. It was just a film of people dancing as they pleased; rather like a colored shadow picture. These were actually artists based in Yokohama who believe in freedom and originality. The film was shot with them imagining music in their heads; the music that they first remember speaking to them as music. When realizing this fact, the installation takes on a new dimension of radiance. Conceptual art is literally a genre of art that expresses thought and concepts, and therein lie the artistic procedure that Michael lives and believes in. The idea of Port Journeys Project is to make our cities better places to live for their residents through sustained mutual exchange and has, with its proponents from around the world, just gotten started. People from different cultural backgrounds engage in multilateral exchange; their discoveries born from activities in art, music, and any number of other creative endeavor lead to an endless stream of more discoveries. It is a truly exquisite work of art in itself, allowing us to dream of where that will take us.